Using our video transcription services is fast and easy. There are many reasons to get your video transcribed. If you want to get the keywords in your video indexed with Google, Yahoo, Bing and other search engines, providing a written transcript on your website is the best way to do this. Many people like the ease of reading a transcript and they actually learn and retain the information better if they can read it rather than just watch a video. It is a nice option to have for visitors to your website to be able to print out the transcript and to take it with them, rather than having to be tied to their computers watching an hour long video. 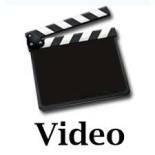 Production companies also need video transcribed and we can handle this quickly and easily. We can also include on-screen timestamps for a small additional fee or running timestamps at no additional fee every half a page. If you need timestamps more frequently, there is a small additional fee of .25 per audio minute. You can send us your video for transcription in one of three ways. The first choice is you can simply use this form to send us a link of your video. Any names or terms we should be aware of? The second option for sending us a video for transcription is to upload files through our file transfer service. This allows you to send bigger files than you can by regular e-mail. Whatever method you choose to use to send us the files, know that we will create an accurate, professional transcript very quickly. Our rates are very reasonable at just $1.50 per video minute, so you know before you even send us your video how much it is going to cost. We can also provide time codes if you need them. Please let us know when sending us a link or the files that you would like to utilize this service. Unlike other transcription companies, we do not charge extra for this feature. We have an A plus rating with the Better Business Bureau, which we are very proud of. Please feel free to call us at (530) 913-3051 or e-mail us at any time with any further questions you may have.